How do you create a post-apocalyptic world on a stage, one where survivors recount an episode of “The Simpsons”? Leave it to University of Iowa theatre arts students Alex Casillas and Nic Wilson, who serve as lighting designer and scenic designer, respectively, for “Mr. Burns, a Post-Electric Play.” Photo by Justin Torner. Imagine a world without electricity. No smart phones, no internet, no movies—and no more episodes of The Simpsons. That’s the world in which Mr. Burns, a Post-Electric Play is set. Written by Anne Washburn, the critically acclaimed play explores what happens after an unknown global disaster destroys the electrical grid. For one group of survivors, trying to recount a classic episode of The Simpsons around a fire allows them a few moments of familiarity and escape from a world turned upside down. Friday, Feb. 3, at 8 p.m.
Saturday, Feb. 4, at 8 p.m.
Sunday, Feb. 5, at 2 p.m.
Wednesday, Feb. 8, at 8 p.m.
Thursday, Feb. 9, at 8 p.m.
Friday, Feb. 10, at 8 p.m.
Saturday, Feb. 11, at 8 p.m.
Sunday, Feb. 12, at 2 p.m. The three-act play, directed by University of Iowa assistant professor Tlaloc Rivas and set to debut at E.C. Mabie Theatre at 8 p.m. on Friday, Feb. 3, follows as the survivors’ campfire stories evolve into a new entertainment industry where the digital culture we know and—usually—love is reimagined without the familiar technology. 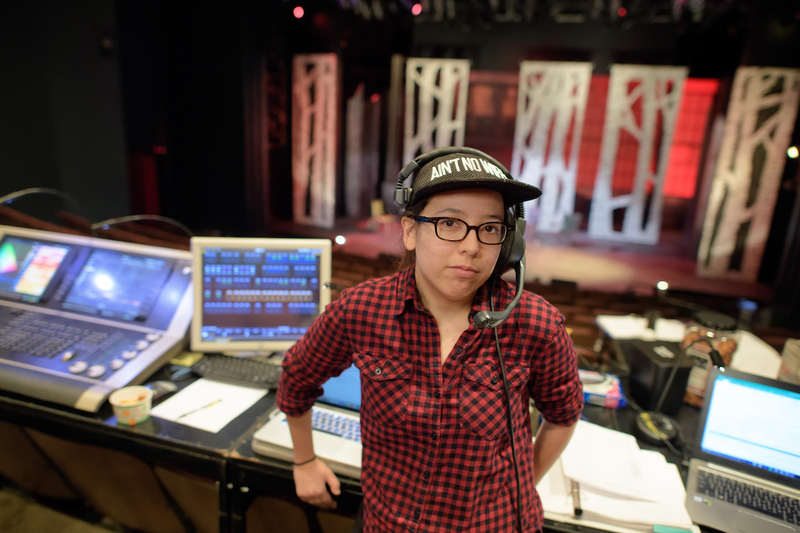 It was up to lighting designer Alex Casillas and scenic designer Nic Wilson, both third-year graduate students in the UI’s theatre arts program, to build much of this strange, unsettling world. Their contributions to the production are also part of their thesis work at the UI. Eric Stone, associate professor in theatre arts and head of design at the UI, says this production is the largest that either student has worked on while pursuing their MFA in theatre design. The somewhat obvious challenge for Casillas is lighting a world without electricity. This is where Casillas’ creativity shines. Despite the lack of electricity in the world she is creating, Casillas estimates upwards of 300 lighting instruments will be used in the play, from traditional theater lighting to paint cans Casillas repurposed as light fixtures for additional on-stage lighting. “This is putting every tool that I’ve learned here to use,” Casillas says. Lighting this play was a wonderful challenge for Alex Casillas. “As a designer, what I’ve learned from this is, even if the goal is to break them, that it’s important to set rules for the world you’re creating,” Casillas says. “If you’re not at least consistently inconsistent, people aren’t going to be on board with the journey.” Photo by Justin Torner. The challenges for Wilson are the volume of scenery he’s had to work with and the fact that he is designing a play that takes place over 82 years. “This has been the show that has had to have the most going on in terms of pieces, parts moving, moving scenery in different locations,” says Wilson, a native of Dallas, Oregon, who also works as a teaching assistant in design. Getting the look of the show right required considerable collaboration between he and Casillas, who both say they couldn’t be more different in their design philosophies and processes. “I almost think that this is the perfect show to bring us together,” Casillas says. Both view this production as the culmination of their graduate work at the UI, though they’ll still have a few smaller projects to complete before graduation. The challenges for Nic Wilson are the volume of scenery he’s had to work with and the fact that he is designing a play that takes place over 82 years. “This has been the show that has had to have the most going on in terms of pieces, parts moving, moving scenery in different locations,” he says. Photo by Justin Torner. Wilson and Casillas each will compile the photographs they’ve taken of their designs for their final portfolios. In addition to the photos, the students detail the design philosophy they’ve developed during their graduate studies and provide design statements for each show they’ve worked on over the three years. Tackling such a challenging project has been both creatively fulfilling for each of the students, but also an incredible learning experience. “I think it’s definitely prepared me for shows that scenically require a lot of flexibility,” Wilson says of Mr. Burns. Wilson plans to use his MFA to follow in the footsteps of faculty who inspired him. 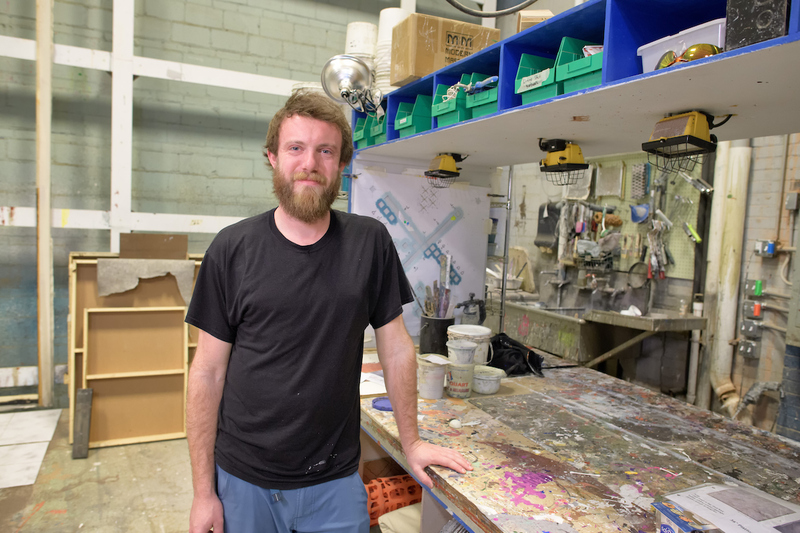 His goal is to teach scenic design while continuing his own design work. Meanwhile, Casillas hopes to one day help promote the work of female playwrights and playwrights of color. In addition to working with each other, Casillas and Wilson also collaborated with faculty, including Rivas, Stone, and Bryon Winn, professor of theatre arts and director of theatre at the UI. Winn, who has worked with both students during their time at the UI, describes the theatre arts graduate program as a three-year mentoring commitment on the part of the faculty. “It doesn’t stop when you graduate, though,” Winn says. He still speaks with his former students regularly about productions they’re working on, even long after graduation.